"How much money will I need for Thailand?" It's perhaps the number one question that Southeast Asia travelers always want to know. Unfortunately, there is no easy, cut-and-dried answer. But we can look at some average expenses in Thailand so that you can produce a more educated estimate. Traveling in Thailand can be very affordable. How much money you spend in Thailand obviously depends largely on what you do (will you be diving a lot or enjoying craft cocktails with every sunset? ), how much luxury you demand, and which parts of the country you plan to visit. Budget travelers and backpackers can often get by in Thailand for US $25 – $30 per day. They leverage smart budget travel techniques to save money because they'll be away from home for a long time. Others travelers on shorter trips with higher budgets and expectations could easily spend double that on dinner and drinks. But that's the beauty of traveling in Thailand: the infrastructure happily accommodates all budgets — and often finds a way to break them! Note: All prices are in Thai baht. Your current exchange rate may affect prices, and you'll always find exceptions for these daily living expenses in Thailand. Finding the best prices and spending less in Thailand are ultimately up to you. Patronizing upscale restaurants and hotels that cater only to tourists will obviously cost more, as will doing more activities (e.g., scuba diving, taking tours, etc) and paying entrance fees to tourist places. All jet ski rentals aside, many long-term travelers brave enough to track daily expenses in an honest fashion typically discover an ugly truth: they spent more on partying and socializing than activities, transportation, and food! Many people tend to socialize — and ultimately drink more — while on vacation. Thailand is infamous for providing enough nightlife opportunities to send daily expenses soaring past your original estimates. Eating can be cheap and delicious, but those drinks add up. Plain and simple: the islands cost more. You've got to pay to play in the sun. Plan to spend slightly more while in the islands on food, basics, and accommodation. Totally worth it! Islands cost more for a reason: everything must be brought to the island from the mainland either by boat or plane. Rent for businesses is invariably more expensive near the sea, so they have to increase prices to make ends meet. Chiang Mai and destinations in Northern Thailand such as Pai are relatively less expensive than Bangkok and the islands. If you're on a shoestring budget, you'll get more for your money in Chiang Mai and northern destinations in Thailand. Location affects price down to the local level. You'll often find better prices depending on the neighborhood in which you are staying. "Local" neighborhoods with less services for tourists are usually the cheapest. You'll nearly always find better prices in Thai neighborhoods farther away from tourist areas. But being a foreign visitor matters. The subject is hotly debated and controversial. Dual pricing in Thailand is common. Farang (foreigners) are often expected to pay higher prices. Tourists may be considered "rich." By default, the Sukhumvit area in Bangkok is the most expensive; Silom is considered pricey as well. Meanwhile, the Khao San Road and Soi Rambuttri neighborhood — once famous as a hub for backpackers — in the Banglamphu area of Bangkok can be cheaper. Although some of the old "weirdness" still exists near Khao San Road, many of the surrounding streets are now lined with chic and boutique guesthouses. A small bottle of beer in the more expensive Silom or Sukhumvit areas of Bangkok will cost 90 – 180 baht, while you can find a large bottle in the Khao San Road area for 60 – 80 baht during happy hours or 90 baht during regular hours. Which of the top three Thai beers you choose also matters. Unless prices are fixed (e.g., inside of minimarts) you can often negotiate for a better deal. Fair, friendly haggling is a part of Thai culture, but do it correctly. You should not try to negotiate for consumables such as water, snacks, and street food. Traveling during the high season in Thailand will cost a little more as people are less willing to negotiate. Hotels and guesthouses stay full enough that they don't need to offer discounts and specials. Traveling during the low season in Thailand (roughly June to October) may require ducking in from afternoon thunderstorms — the monsoon season keeps scenery green — but you can find more discounts. Traveling immediately before or after major festivals and holidays in Thailand such as Songkran and Chinese New Year will cause flights and hotels to be more expensive. The cost of your accommodation depends largely upon how much luxury you expect. Remember, with such an exciting country waiting outside, you'll probably only be at the hotel to sleep! Avoiding the large Western hotel chains and staying in local, independently owned places will nearly always save money. Cute boutique options abound throughout popular places to travel in Thailand. Moving around frequently adds to the cost of your trip. If you intend to stay in a place for a week or longer, try negotiating for a better nightly rate. You may get a better deal — particularly during the slow season. You'll find backpacker guesthouses in Thailand for $10 a night (320 baht) and less, as well as five-star accommodation where the sky is the limit and staff are willing to do anything to please guests. If your trip is short and you don't mind spending more on accommodation, you'll be able to enjoy much higher levels of luxury for cheaper prices than you would find in hotels at home. As is often the case in Asia, eating in Thailand is relatively inexpensive — assuming you enjoy Thai food. Western food nearly always costs more than Thai food in restaurants. Street carts and simple, open-air restaurants will always be cheaper than eating at your hotel or in air-conditioned restaurants. Adding seafood or shrimp to traditional dishes increases the cost. The default meat served with nearly every meal is chicken; beef and pork are common options. The average cost of a basic Thai meal in a restaurant is 90 – 150 baht. Seafood invariably costs more. A plate of noodles in a basic restaurant in Sukhumvit is around 100 baht. 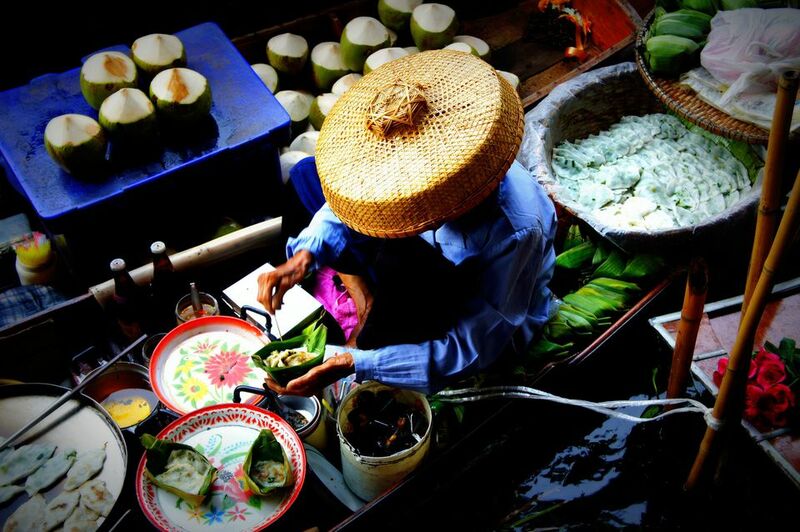 Thai portions are often smaller, so you may end up eating an extra meal or snacking during the day! Tip: If you find yourself near the Asok BTS stop in the Sukhumvit area of Bangkok, check out the food court at the top of Terminal 21. Although the mall is home to some posh stores, local residents head to the food court to enjoy good food for street prices in the area. Since many people enjoy pad thai noodles in Thai restaurants at home, the menu item makes a great benchmark for comparing food costs! Spoiler: the much loved noodles are way cheaper in Thailand. A basic meal of pad thai noodles with chicken or tofu can be found at street carts and from simple restaurants for 30 to 40 baht (around US $1), particularly outside of tourist areas. The average cost for pad thai in tourist places is around 50 baht per plate. One of the famous Thai curries can be enjoyed for 60 – 90 baht; sometimes an additional 20 baht is added for rice. The tap water is unsafe to drink in Thailand; hot temperatures will have you drinking far more water than you do at home. A 1.5-liter bottle of drinking water from any of the ubiquitous 7-Eleven shops found all over Thailand costs around 15 baht (less than 50 cents). To cut down on plastic, look for free water refills in some hotels. Also, you can find water-refill machines on the street that cost only a few baht per liter. In the islands, a fresh drinking coconut can be enjoyed for around 60 baht. A nostalgic, glass bottle of Coke costs around 15 baht. A large bottle of Thai Chang beer can be found in restaurants around Khao San Road / Soi Rambuttri for under 90 baht. 7-Eleven price for a large bottle of beer is usually less than 60 baht. Other beers such as Singah and imports will cost at least 90 baht and up, depending on the venue. A small bottle of Sangsom (the local Thai rum) costs around 160 baht in minimarts; there are cheaper brands (Hong Thong is one) if you're brave enough. A night out in an establishment with band or DJ will always cost more than a night of socializing in a restaurant or somewhere quieter. Unless you're attending an organized event or special party with DJ, cover charges aren't common. You'll find no shortage of offers for transportation from taxi and tuk-tuk drivers. Hailing a taxi on the street is best; always make the driver use the meter! If the driver refuses and tries to name a price, simply pass and wait on the next taxi. You'll eventually find an honest driver willing to turn on the meter. The prices for taxis from Suvarnabhumi airport are always changing. These are literally controlled by a sort of local transportation "mafia." You're better off taking a train closer and then hailing a taxi. There are sometimes minivans running from the ground floor of the airport to Khao San Road for 150 baht. Although riding in tuk-tuks is a fun experience, you must first negotiate a price before getting inside. In the long run, taking a sweaty, exhaust-choking tuk-tuk is rarely cheaper than going somewhere with an air-conditioned taxi. Times have changed. Taking a tuk-tuk is more about the experience than saving money. TIP: Beware of tuk-tuk drivers who offer to be your dedicated driver for the day! This is one of the oldest scams in Thailand. Ferries running the Chao Praya River in Bangkok can get you around the city for far cheaper than a taxi. Depending on the destination, a single ride averages 30 baht. You can also purchase an all-day ticket for 150 baht to make unlimited hops. Don't be intimidated: it's a great system for getting around Bangkok's consistent traffic! The BTS Skytrain and MRT subway in Bangkok are cheap and modern ways to move around the city. The fare rarely exceeds 30 baht. An all-day ticket can be purchased for 150 baht. Night buses and trains are a good way to move across Thailand; both save a day on your itinerary and double as accommodation for the night. Overnight buses from Bangkok to Chiang Mai can be booked in travel offices for 600 baht or less. Trains cost more than long-haul buses but offer a more comfortable experience. If you don't have baggage to check, flying domestically in Thailand can be very cheap with local low-cost carriers such as Nok Air. The fees for baggage and other add-ons are what make flying cost more. A pack of Western-brand cigarettes costs 100 to 140 baht in Thailand, depending on the brand. Outside of luxury hotels and nicer restaurants, tipping is not expected in Thailand. Using any ATM in Thailand requires paying a steep 200-baht bank fee for each transaction. Laundry service is very cheap in Thailand. Coin-operated laundromats can be found in the cities.